If dinner and a movie are too mundane for your next date, why not try a nighttime bike ride through parts unknown or a private magician’s club? Or perhaps you’d like to test your compatibility by solving a series of puzzles to escape a locked room. Here are 15 L.A. date ideas that take getting to know you to the next level. See how well matched you are in a high-pressure situation by taking your date to an escape room. Los Angeles has several escape room companies with all sorts of fantastical themes, from outer space to a 1920s detective’s office. You’ll have an hour to solve a series of puzzles to either “escape” a sticky situation, solve a mystery, or achieve a world-saving task. You’ll typically be in groups of six to 10, so it won’t be quite as intimate as other dates. It’s great, however, for a double date or for couples that enjoy gaming. Some good companies include 60 Out, Maze Room, Stash House, Escape Room L.A., or Evil Genius Escape. Escape Room L.A.’s The Pyramid | ©Benjamin Jet, Courtesy of Escape Room L.A.
Deviled Eggs is a saucy burlesque brunch taking place at a series of rotating venues around Los Angeles. The themes vary, with past shows capturing the roaring ’20s and decadent ’70s, but each ticket will get you a full meal, performances, and brushes with interactive characters. Sign up for Drunken Devil’s mailing list to find out when the next installment is. You might feel like taking your date to a bikini bar is odd, but Jumbo’s Clown Room is a Hollywood classic. Talented dancers entertain to all sorts of music, including metal and ’90s alt-rock, while bartenders pour stiff drinks with just the right amount of surliness. You wouldn’t be the first person to take a date here, rest assured. And, since you’ll be in Thai town, you can follow it up with a delicious meal. If you can score an invite to this private magician’s club, you can enjoy dinner with some sleight of hand. Once you’ve scored the coveted magician invite, which you might be able to do by contacting a specific performer you’d like to see, you’ll need to adhere to their strict dress code. You can enjoy a seated dinner, but there are also plenty of opportunities for drinks at the various bars, where tricks and treats await. If you’re a fan of Netflix’s Love, you’ll note that Gus took Mickey on a date to the Castle, and she hated it. So, perhaps check in with your partner before you splurge here. 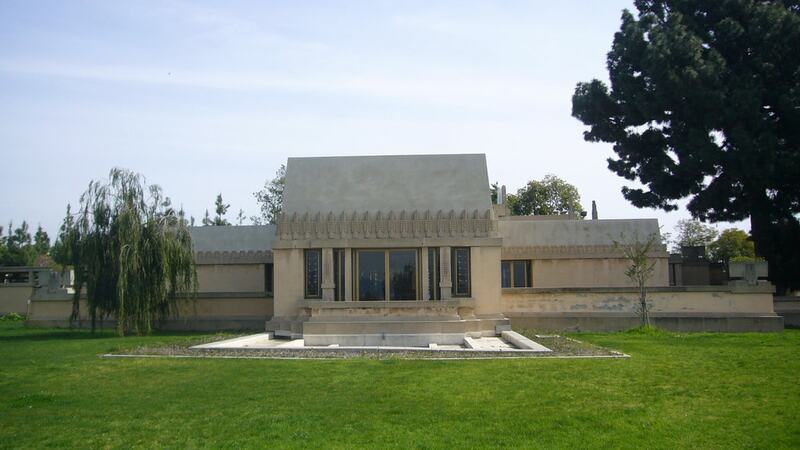 You can hang out in this scenic park for a picnic or a walk, complete with beautiful views of the city and the Hollyhock House, designed by Frank Lloyd Wright. 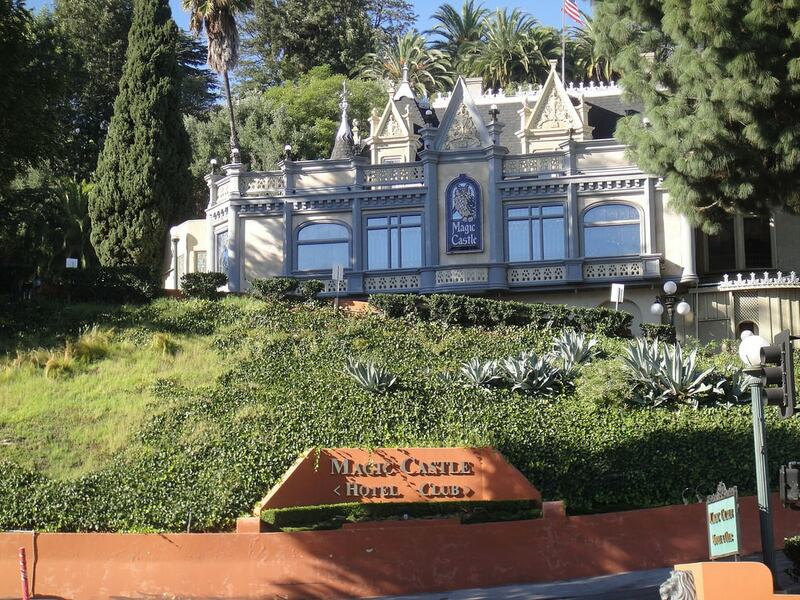 You can even take a tour of the house Thursday through Sunday, 11 a.m. to 4 p.m. (The last ticket is sold at 3:30 p.m.) Here, you’ll find the Los Angeles Municipal Art Gallery (LAMAG), open Thursday through Sunday from noon to 5 p.m. and on the first Friday of the month from noon to 9 p.m. One will typically find group shows, with art from a variety of mediums, including the annual Department of Cultural Affairs City of Los Angeles’ Individual Artist Fellowships exhibition. For a special occasion, check out Chef Phillip Frankland Lee’s Sushi|Bar. It’s hidden within the restaurant Woodley Proper. It only has eight seats, so you’ll have to get there early to sign up for a slot at one of three nightly seatings. Guests will be treated to a 16-course omakase sushi meal, but it’s not cheap, running $110 per person (drinks are extra). If you can’t score seats at the sushi bar, Woodley Proper’s not a bad spot for a bite, drinks, and conversation. Consider making a reservation at one of Los Angeles’ dog or cat cafés if you and your date enjoy the company of furry friends. Here, you’ll be able to get a coffee, tea, or snack before hanging out with one of many adoptable animals. The Dog Cafe in Rampart Village will cost $15/hour, plus the cost of drinks. Crumbs & Whiskers on Melrose will cost you $22–25 for a 70-minute reservation, and drinks and snacks are available via Open Space LA, who will bring them to you. CatCafe Lounge in West L.A. is a non-profit cat café, meaning your entry donation is deductible. Located in a Little Tokyo mall, XLanes is a modern arcade and bowling alley with a little bit of everything. If you’re not a bowler, you can amuse yourself with one of several video games, karaoke, drinks at the bar, or a bite to eat. They serve standard bar fare. On Wednesdays, Thursdays, and Sundays, Hamburger Mary’s in West Hollywood offers their legendary Drag Queen Bingo. For a fee of $20 (which is donated to a different charity each time), you’ll get several bingo cards and a marker. Your flawless drag host will lead the game, and if you are lucky, you may go home with a fabulous prize. Winning, however, comes with a price; the losers in the room are encouraged to ball up their bingo cards and pelt the winner as they claim their prize. Call ahead to reserve a table. Lost Spirits makes whiskey and rum using a complex chemical process that’s fascinated booze enthusiasts. But for the casual imbiber, their enchanting facility tour is the more exciting draw. Guests will encounter animatronic dinosaurs, a cheeky computer, and a boat ride in the dark through the water that cools the cisterns. It’s a lot like a theme park, but for those over the age of 21. The approximately two-hour tour costs $35/person and includes sample tastings of the distillery’s products. From 9 a.m. to just before sunset, you can rent a pedal boat and take it across Echo Park Lake. Rent your trusty vessel from the boathouse ($10/hour) and pedal freely under the sun. You can follow this outing with a picnic or stroll through the park, or perhaps a round at the nearby Bar Bandini. The Passage Ride is a unique bike ride that anyone can join. They typically meet on Wednesdays at 8:45 p.m. at California Donuts, a 24-hour donut shop in Koreatown. (You should note that on occasion, they will skip a Wednesday and run a Saturday ride during the day instead. Check the website in advance.) Though the routes begin at the same location, they vary each time and often have some kind of theme. You should both be prepared for a little off-roading, a few stops, and the occasional challenge. If you and your date are comfortable riders with decent bikes and a sense of adventure, however, you should both be fine. The San Fernando is a beautiful cocktail bar that takes its design cues from the 1940s, Art Deco style, and train travel. A menu of shareable bar bites and creative cocktails will provide the sustenance and liquid courage, while live entertainment may include live jazz or karaoke. The San Fernando is not far from the Moonlight Rollerway—if you feel like partaking in a couple’s skate before or after. The Virgil is a cocktail bar, which is always a good place to begin a date. The bonus is that they also run a fine comedy program, including the variety show Hot Tub on Mondays, hosted by Kurt Braunohler and Kristen Schaal. You’ll find a wide array of craft beers and cocktails, and if you’re not catching a show in the venue portion, you can fire up some tunes on the jukebox in the B Side Bar. 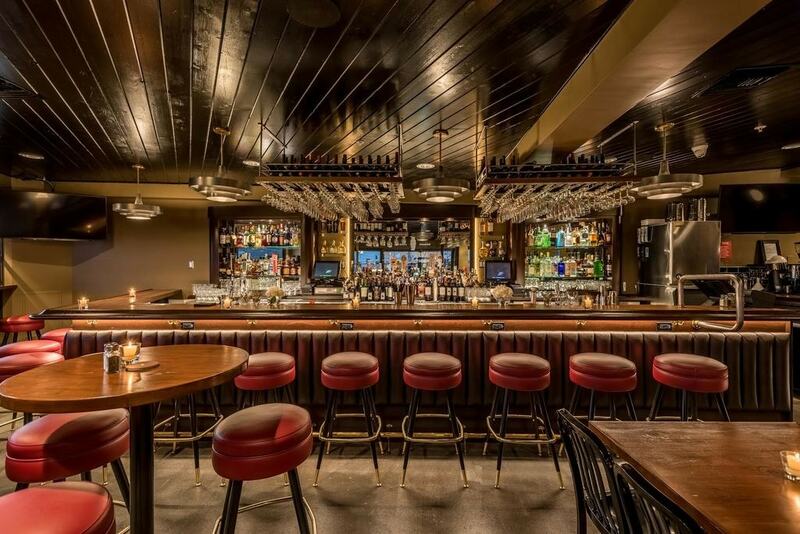 The Virgil opens nightly at 7 p.m. 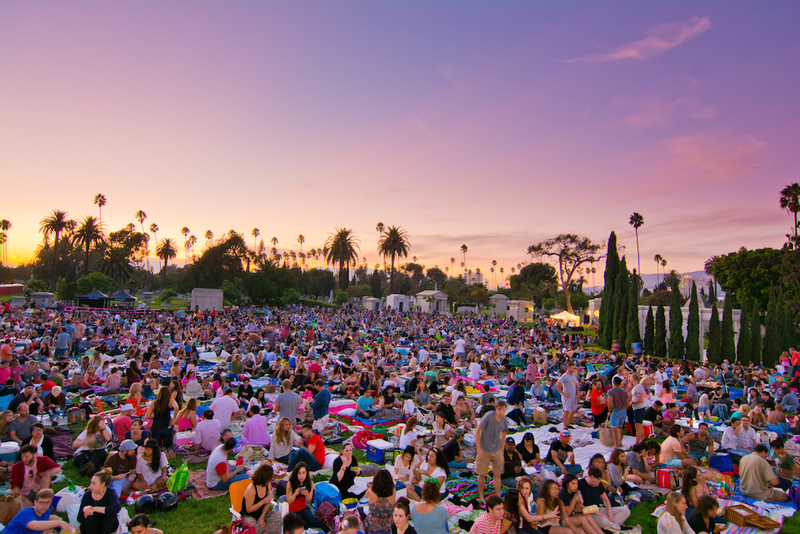 If the season is right, you’ll be able to take in a movie outdoors in a strangely picturesque venue: the Hollywood Forever Cemetery. At Cinespia screenings, spread out across the grass with picnic baskets to watch classic and beloved films. There is usually an interactive photo booth set up, and costumes are always welcome. It’s worth checking the Cinespia site even when it’s not the season for cemetery screenings, as they host movies in historic theaters and other venues year-round.